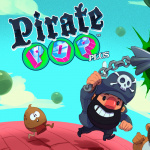 Pirate Pop Plus recently launched on the 3DS and Wii U eShops, and the game received a hearty recommendation from us. Produced by dadako, this bubble-popping action title uses Game Boy-style visuals and audio to create a unique "faux-retro" experience which has predictably enraptured players old enough to vividly recall burning through packs of AA batteries back in the early '90s. Of course this is quite some way away from being an official confirmation that anything like this is happening, but would you be interested in buying a physical copy of Pirate Pop Plus for your dusty old monochrome handheld? Let us know with a comment. I've been searching and I haven't found any evidence of any game for the Game Boy (it's sad, but I have to specify that I mean the classic one, not GBC, nor GBA) released in cartridge format after the last official release. But it can be me searching with the wrong words. Does anyone here know about "modern" cartridge Game Boy releases? If true, I would definitely get it to play on my GBA SP. Why not on 3ds first????!! looks really fun! sounds great!